Alas! that so few bars are prepared to serve a properly made Sidecar, and so many prepared to abuse us with sours shot from guns. I’ll save that rant for another day. 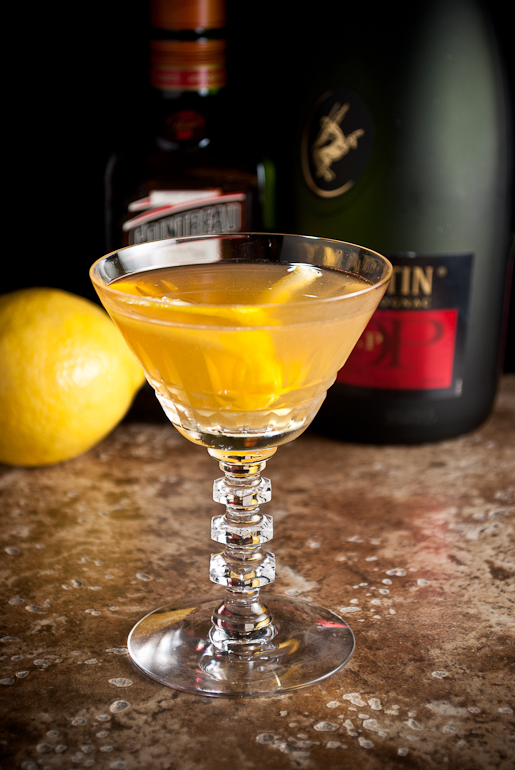 Embury makes the claim that the Sidecar is modeled on the Daiquiri, but that focus distracts from the Sidecar’s heritage as a standard, old-school sour built with base spirit, citrus, and sweetener. Gary Regan, in his Joy of Mixology , identifies a sub-category of sours, the “New Orleans Sours,” sweetened with liqueurs; the Sidecar fits perfectly into this class. There are many recipes, depending on how you prioritize boozy, sweet, and sour. Most include brandy, lemon, and curaçao, in varying proportions and styles. Early recipes often suggested equal parts of each; this makes a very sweet drink, beyond my tolerance, I’m afraid. At least I’m not alone in that: sweetness is exactly where Embury thought the Sidecar had “gone wrong” too. In his usual style, he goes way in the other direction: heavily spirited, with 8 parts brandy, 2 parts lemon, and one part Cointreau. Much drier, but also quite lemony. Shake with ice, double strain into a cold cocktail glass, express and garnish with a lemon twist. This works well for me—enough Cognac to assert that this is a brandy drink; enough Cointreau to provide a bit of sweetness (and the classic orange notes); and just enough lemon to temper Cointreau’s sugar and brighten the overall flavor. You don’t need the world’s best Cognac for the Sidecar, but you don’t want any old cheap brandy, either. The Remy VS and VSOP both work well, and don’t break the bank. Once upon a time, I had a bottle of Sempe Armagnac that made the best Sidecar I’ve ever encountered. Too bad that my Minneapolis stores don’t seem to sell it anymore. Most modern recipes call for Cointreau, but it’s worth it to experiment with other orange liqueurs. I find Grand Marnier a good addition to the flavor mix—a bit more lush and complex than the simpler Cointreau. “The Sidecar Cocktail” at cold-glass.com : All text and photos © 2009–2013 Douglas M. Ford. All rights reserved. [enjoying a Pegu club and considering another cocktail… so forgive my prose] I searched your site to see if you had posted a Sidecar recipe and wanted to see the variation you went after. I make a variation published in the “World’s Best Bartenders Guide” [unnecessary hyperbole, but descriptive – recipes gleaned from exceptional bars around the world]. Several sidecar recipes are available in it, but the one I like best, although a little sweet with the sugar-rim, is the Higgins Sidecar. Variations from above – less Cointreau, but a little sugar. and the citrus is both lemon and lime, and they’re muddled with the sugar. It is a favorite in our house. Well done Mr. Ford on the site, beautiful photography, writing, and of course, great drinks! Thanks for the kind words, Chris. I was just pondering what might be a good cocktail for a sweltering summer day, and now I’m thinking it’s just about time for Sidecar. I’d not been aware of the Higgins version until now, but I look forward to trying it. Any thoughts on the oft-encountered sugared rim? My preference is an unsugared rim. I don’t mind sugaring it for others, if that’s what they like, but I don’t pursue the extra sweetness. Besides, I’m sort of lazy, and happy any time I can cut a picky step out of a recipe. And of course, there’s the problem of sticky cocktail glasses. The only way I know to avoid that is to sugar the rims ahead of time, so they can dry out, leaving only the dry sugar crust. So, Matty, where do you stand on sugared rims? I admit that I love the sugared rim, largely because of the way it looks (at least when it’s done well). But I only use the sugared rim if I can prepare it in advance and let it dry. I certainly agree that sticky cocktail glasses are not at all desirable! Excuse me for chiming in 4 years later… I find the sugar rim helps to balance the tartness of the drink. The Higgins version is interesting as without the sugar rim I also feel like the drink benefits from a Dash or two of simple syrup. I’ve been told that Cointreau used to be a triple sec liqueur and is now less sugary – an extra sec now by definition. Possibly this addition of a splash or two of simple syrup is putting back the sweetness that would have originally been in the drink made with the older version of Cointreau..? Hi, Donough, I’m glad you chimed in four years later; it’s always fun to revisit these conversations. The Sidecar is one of my favorite exercises in balance; in fact, it could be an excellent teaching tool for people new to mixing, to learn how much slight differences in proportions (or products) can affect cocktails. And with the Sidecar, when it’s right, it’s gorgeous. I was unaware of the changes in Cointreau over the years, so that’s educational. And its curious that some prefer Grand Marnier to Cointreau in their Sidecars; I don’t think GM contains more sugar than Cointreau, but its lushness seems to convey a sense of added sweetness in comparison. And so the sugared rim, in addition to being ornamental, provides a way for the bartender to satisfy the customer either way, more or less sweet at the drinker’s discretion. Thanks for adding this for consideration, and for reading Cold Glass. Hi Doug, a drink composed by a Sour formula + Triple sec/Curacao/Orange liquor, is this family known as “New Orleans Sours”? The Sidecar is one of my favorites, I prefer the “french ratio” 1:1:1 with Cognac or Brandy and the “english ratio” 2:1:1 with Brandy de Jerez Solera Reserva. Yes, that is a New Orleans Sour. We owe the term to Gary Regan, who first wrote about the category in his Joy of Mixology. It’s a very useful classification. My usual starting point is usually pretty close to your (roughly) 3:1:1, and I adjust from there, depending on the drink. In the case at hand, the Sidecar, I get pretty well away from that rule of thumb, more like 4:2:1. I don’t know why those proportions work better here, except that perhaps brandy doesn’t like lemon quite as much as some other spirits.